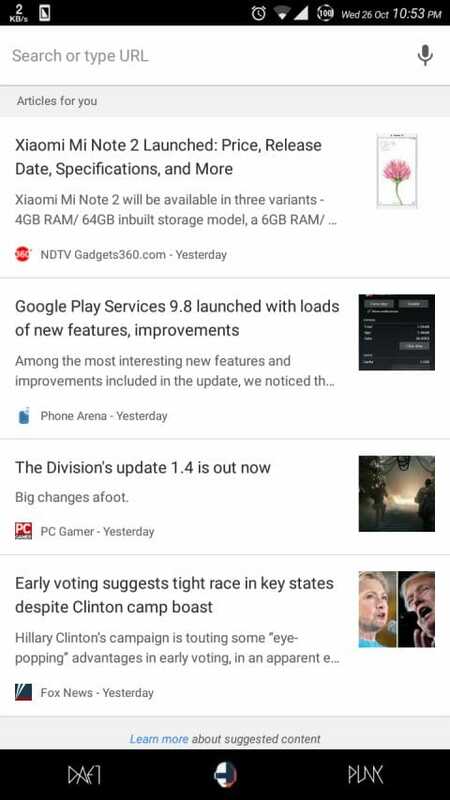 If you scroll down a little on the homepage of Chrome for Android, you will see a list of suggested articles based on your interests. These articles are listed as ‘Articles for you’. This is a new feature in Chrome 54 release which was released on 20th Oct 2016. You can disable this suggested content using Chrome flags. To do that, enter you will need to disable the NTP popular sites and NTP snippets flags. Paste the following two links one by one in the address bar of Chrome on your Android phone and select ‘Disabled‘ in the highlighted (yellow) values. After making the changes, tap on the relaunch button. On restarting the browser, you will see that the ‘Articles for you’ section is gone. Of course, if you set them to enabled again, these will start showing again on your feed.